This is an easy, pretty bread that looks great on a buffet. My grandma used to make it, and it’s a must-have at my family’s holiday table. Although it’s a breeze, it’s no last-minute affair, as you must thaw or make the bread dough ahead of time. Generously spread with olive oil, then shake on some salt and plenty of medium-to-finely ground (anything but coarse) fresh black pepper. 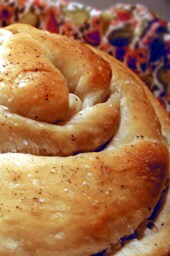 Roll up into a rope, stretching dough a bit more as you go. Coil the rope snake-fashion in the pan, oil the top, and sprinkle with salt and pepper. Let rise at room temperature at least 30 minutes for a denser loaf. Alternately, to double in size, cover with oiled plastic wrap, refrigerate, and let rise overnight (handy for hectic holiday meals). Longer rising times make a larger, prettier loaf, but I somewhat prefer the denser version I get when I’m impatient and don’t want to fuss over the rising time. Bake until golden, usually 25 – 30 minutes. Serve warm or reheat 5 – 10 minutes before serving. This entry was posted on Thursday, September 6th, 2007 at 7:09 pm	and is filed under Bread, Master Recipe Index, Vegan or Vegan-able, Vegetarian. You can follow any responses to this entry through the RSS 2.0 feed. You can leave a response, or trackback from your own site.